In researching literature about writings by gang members and literature produced by gang members, or exgang members there was not an abundance of information. The sources that are most prevalent are actual autobiographies by gang members. There is enough to read and grasp what is going on, but in the larger scheme of things, there is not many. The majority of the autobiographies that we have today are the experiences and lives of gang members from at least ten years ago. The first gang autobiography was written in 1930 by Stanley Williams. (Brumble) More recent ones consist of such autobiographies as Kody Scott’s and Luis Rodriguez’s, both were produced in the 1990s and depict gang life of the 1960s (Rodriguez), and the 1970s (Scott). Even autobiographies produced no less than 5 years ago are usually about gang life in the 1970’s through the 1990s, such as Colton Simpsons autobiography. This consists of the majority of gang autobiographies. The ones being produced and read today are about the lives of gangbangers twenty plus years ago because it takes years for the members to get out of the gangs, transform their lives and write about it. There also exists a lack of articles and further research into and about the autobiographies that are produced. Due to this fact it is just as hard to find a good article about a past autobiography as it is to find a current autobiography. The lack of literature and available research seems to suggest this topic does not get studied and looked upon in the same fashion as many other social issues of today. There may be a lack of research into this topic because autobiographies are such strong pieces of work. They are very capable of speaking for themselves. All together however, gang autobiographies are not swarming our libraries. This could possibly be due to the facts of life for a gang member. Many gang members have poor education resulting in the lack of their ability to read or write, thus minimizing and creating a more oral culture. Another reason could be the negative effects the writings can have on the authors. For example when Colton Simpson wrote his autobiography, he was charged with crimes mentioned in his book, and his book was used as evidence against him. The lack of literature regarding both autobiographies by gang members and research into the autobiographies can be looked upon with surprise and some understanding. There are aspects of gang life that decrease the probability of self produced literature. The gang wars of today and the last eighty years are however, a big issue in our inner cities and society, and the autobiographies provide a source into a world we know little about. The autobiographies should be used to their fullest advantage; the information they provide should be studied, researched and used. Brumble, David. “Stanley ‘Tookie’ Williams, Gangbanger Autobiography, and Warrior Tribes” Journal of American Studies 44 2010: 155-170. Internet. Brumble, David. “The Gangbanger Autobiography of Monster Kody (Aka Sanyika Shakur) and Warrior Literature” American Literary History 12 2000:158-186. Internet. 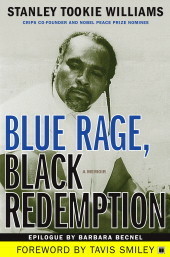 “Blue Rage, Black Redemption.” Boarders.com. Web. 2 Dec 2010.